This is a walkthrough for new players. This topic will give you hints on what to watch out for and give you tips and tricks for the early game (Gameplay until you can do your first ubers) as well as showing how to prepare for the midgame. I try getting to the point while explaining the core mechanics in detail. If you ever have a question, there are people willing to help you in the discord. Alternatively you can also ask your question in the short question thread. Discord is almost always faster though. Please note that even I don't know everything about the game, so there might be questions I can't answer, so it's always best to use the previous mentioned sources for questions rather than this guide topic. Defense is the main option to avoid damage. Throughout the game there are mobs that quickly run at you, swarm you and may or may not bring you into the hit recovery animation without you being able to fight back. Defense is mainly used to avoid this, because it causes the enemy to miss which means the hit recovery animation won't be triggered. For most builds a decent amount of defense is around 300.000-500.000, but some builds can get higher. A little hint: If you struggle with defense, you can always go to Gheed and buy some mystic orbs for Enhanced Defense (in short ED) and cube them with your armor items in order to get the base defense of your items higher. Total character defense (in short TCD) can be cubed with your items after that, but is rather bad if your build already gives you lots of Total Character Defense. For example Dragonheart from Paladin can give you 1000% TCD in lategame. 20% more TCD from Mystic orbs won't affect your defense much. ED Cap: 200% per item. This can only be bypassed with sockets. Physical resist is straight forward as the name says: It reduces incoming physical damage. This is capped at 50%, so getting more is not necessary. It's the same like physical resist, except that it's for elemental damage and poison. It's capped at 75%, but that cap can be raised to 90%. While you can get trough normal difficulty without fully maxed elemental resist, it's always nice to have more and possibly get at least more than 50 of each by the time you reach act 3 because in act 3 you'll notice that you really need it. From the importance factor this is as significant as physical resist because it greatly improves your ability to reduce incoming damage. This modifier increases the resistance cap to elemental resist up to 90%. Why this is so important: Imagine the game is balanced around 75% resist. If 1000 damage are incoming, you only receive 250 damage. Now you increase the cap to 90 and the damage that actually hurts you is reduced to 100 damage. That's another whopping 60% damage reduction if you consider 75% resist as your base. Avoid has the wonderful mechanic that it affects everything, both physical and elemental attacks. It's a very random way to improve your survivability, but it's still a decent option nonetheless for some character classes like Assassin and Druid. It also doesn't trigger any animation, which only increases your survivability further. 10% May not give you much, but the ability to potentially avoid a 1-hit-K.O. attack is really nice. Not every class has access to many sources of avoid. The easiest way is your character specific passives. 2) Raise your dexterity. Added dexterity from for example +% dex and flat dex from items can greatly help getting a better block chance. If an attack is blocked, it completely negates the damage. However, that still puts you in the Block animation, which makes this significantly worse than Defense, but still good. After all you can still reduce the total incoming damage by up to 75%, but you need to focus more on Faster Block Rate in order to not get locked in your block animation. Shrine Crafted items with Abondoned Shrines. This is one of the most important stats in the game because it affects both spells and weapon damage skills if they have an elemental conversion. For casters it's important to have both spell damage and -enemy resist on about the same level, but still -enemy resist is more important because spell damage is a lot easier to obtain. For example you can just get 10% of any type of spell damage from mystic orbs alone. On each item you wear. So that's 100% spell damage. Add to that spell damage that's already on your gear and you'll easily get to 250-300% spell damage, on many builds even higher. As explained above, spell damage is not as important as -enemy resist, but it's still important to raise your spell damage nonetheless. Just getting 100% more spell damage reduces your kill time significantly. Like Ehanced Defense, this is capped at 200%, but can be raised further with sockets. For any WDM (Weapon damage modifier) build raising this stat on your weapon is very important. You can have all the damage you want, but if you can't hit your enemy it won't do you any good. So this modifier brings lots of benefit to any strength-based build. +Skills is the last modifier I want to talk about. This raises your total skill level by 1, but it also increases your mana cost. On Mana-hungry builds you may want to avoid stacking this modifier in early game too much, but later on you can work against the high mana cost easily with items and mana regeneration mystic orbs on rings/amulet. For how to craft items I'd like to forward you to the Crafting Compendium by Ryunp, because I think he's done an amazing job to put all those information together. Even though it's in the old forum section, this guide is still up-to-date, so take a look into his topic to get the crafting explained in detail. With the Catalyst of Disenchantment (Dropped by the Smith in Act 1 on normal difficulty) you can disenchant unique items that you don't need or like into arcane Shards. Cube 5 Arcane Shards together to create an Arcane Crystal. It's not possible to craft Sacred Uniques that way. 1. Find a good base item. Best base items for the slots are Diadem/Ancient Armor/Greaves/Gauntlets/Plated Belt because they give you lots of defense. 2. reroll that item with an oil of renewal (bought from Gheed) until you reach up to 35% ED and a good amount of defense/damage depending on the weapon. Just calculate how much is possible by getting the base information from this page and adding the 35% to the maximum value. Also watch out for sockets, since you want to have 6 sockets in the end for more jewels. If your armor has no sockets, you can cube the item with jewels to obtain the sockets. For example if you want to add 4 sockets, cube the item with 4 random jewels. 3. Upgrade that item with a oil of luck (bought from Gheed) for another 20% ED and/or 1% physical resist on any armor pieces or bonus to attack rating on weapons. If it fails, go back to step 2. 7. Socket the Xis rune (in case you go for the Kabraxis-enchanted runewords. Why we do this? To get the best bonus to ED possible. If you have 55 ED from the base + Lucky, and add another 75% from mystic orbs, you'll end up with 130% ED. And if you add a runeword now that grants 200% ED, you'll get the full bonus and end up with 330% ED. If you put the mystic orbs on the item AFTER you created the runeword, the level requirement will rise, but not the ED, because it's already capped and runewords and sockets are the only way to bypass the cap of 200%. Let's say you add the rune right after you lucky it, then you'll end up with 255%. If you put the mystic orbs on now, you'll still only have 255%. And that's a huge difference, so make sure to follow that step-by-step guide. To make an item rare, there's only 1 possible way: Use the Quest reward from charsi. So each character can only do this 3 times, but that's most of the time all you need anyway. And that's all I want to say about Crafting. I'll make it short and just sum up each character class in total, and what you can expect from each class as well as hints for items. - Once you have a devotion, other skilltrees except for the neutral and the one where you have the Devotion are locked out. On the other hand, if you put points in more than 1 devotion tree, you can't put points into the devotion passive. So watch out! - The only class that relies on avoid, stun and physical resist with almost every spec. - Skilltrees aren't locked out, so you're free to skill whatever you want. Brings lots of summons to you that can block some damage. Use it when you're stuck. - Can easily get up to 50% DR thanks to Bear Stance. That also opens up more item choices. - Perfectly viable for any beginner, because it has more life than any other class and also a passive that increases max life even with just 1 point spent. is one of the best shields in the game because of the high defense, free stats, physical resist and the proc. - 1- point Poison flash can easily carry you to level 6 very fast to get a better AoE attack. That's useful for every shapeshifter build because they lack an AoE before level 6. - Skilltrees's don't lock out but thanks to weapon choice, it's basically locked out. There's not much freedom of choice concerning the builds themselves, but they are all viable. - Once you reach level 90 you get a ton of defense, HP and possibly even avoid for free. - You can walk into higher level areas without much preperation if you use Elvensong skill to charm enemies. - Has the 2nd highest amount of possible avoid right after assassin. But druid also has nice HP and defense. - Don't use Veil King. Just don't. - Use Void Archon. Just do. - Embalming solves most mana issues and grants lots of additional HP. 10k HP are easily achieved with 0 vitality investment. - Gets lots of physical resist and damage reduction from the Black Road skill and a morph on level 90 that always complements your playstyle. Those morphs have bad hit recovery animations though, so make sure to get some hit recovery speeds on your items thanks to mystic orbs. is one of the best shields in the game when it comes to elemental attacks. has an incredible aura that boosts your maxlife by 50%. Don't use it if you plan on utilizing block though. - Uses 4 different elements, of which you can choose 2 at max and you get another 2 skilltrees, one is for a sorc based on maximum mana, the other is the melee tree. - Most people play melee, so check out Solfege's guide, which is still mostly up-to-date. - Can fill her mana orb easily with Mana sweep, so make sure to make use of it. can solve most of your mana problems if you don't want to use Mana Sweep to get back mana. In the next section I will display the most dangerous monsters of each act, where to find them and give you strategies to fight them. As a general rule I can tell you: Every slow-moving missile should be avoided. The displayed monsters are even stronger in Nightmare and Hell, so for general gameplay please read this section. The "Nightmare Difficulty" section won't have the focus on the general and elite monsters, but instead focus on the veteran monsters (for the +1 skill upgrade on your class charm). for a good chunk of bonus life early on. Note: You may not be able to finish one for every slot. In that case prioritize the belt and the armor since all resist are very important from early on. Pro tip: Some builds don't have a huge AoE or are rather slow in their killspeed. If you happen to find yourself in a bind when it comes to damage, do the following: Get a act 1 priestress merc, go to Gheed and gamble a Short War Bow, Short Battle Bow, Long War Bow or Long Battle Bow (can be gambled from level 8 onwards). That will make act 1 a breeze for you. Also, you only need to be level 8 in order to buy an act 1 merc. You don't need to kill Blooraven. You can find them in the Den of Evil, the Cold Plains and on the Stony Field. They release a barrage of spikes after they die. You can easily avoid most of the damage if you walk a bit away right after you kill them. Those enemies spawn in the Stony field and the Burial Grounds. Of course you can just stay away from them if you want. But if you choose to fight them, finish them off quickly or at least make them retreat. They attack the player with lemures, which can really hurt you if you don't move. If you choose to fight them, stay on the move to avoid their projectiles. Those guys are walking treasure chests! They always drop gold for you, so killing them is really great to get rich. But they use a poison flash attack, which hurts you in close combat. Stay away from them if possible. As melee you want to end them quickly or use a hit-and-run strategy. They also exclusively spawn in the underground passage. These wasps that spawn in the Black Marsh cast a short-ranged lightning attack that can really hurt you. They are also really fast, so you can't really escape them unless you have minions. It's best to kill them either on their way to you, or with a melee AoE attack to get them into the hit recovery animation. Once you did that, they are easy to kill. These nasty little creatures that spawn from the Tamoe highland on are really fast, but not really strong. You can't outrun them, so you should get rid of them as soon as you can. But beware! Once they die their shamans use their bodies to create a barrage of spikes like the Quill bears did, except that this time it's stronger. It's adviced to ignore other enemies and kill the shamans as soon as you killed the swarm of cogs. These guys spawn only in the Catacombs level 3 and 4 and they have a dangerous stun attack. It's not dangerous if you attack them 1 on 1, but if they surround you they can stunlock you to death. In order to avoid dieing to them don't let them come close and only attack them 1 by 1. Use doors to prevent them to surround you like the 300 Spartans in the movie 300, who used a small passage in order to prevent being surrounded. The first act boss really doesn't want you to get close. She can cast a meteor shower, which can easily annihilate you if you have low fire resistance. And when you get close to her she casts Hive, which is a poison spell that hurts you a lot. So if you're melee focus more on poison resist. And of course her third attack is again a fire based attack. She lays some spikes on the ground, which can kill you even after you already killed andy. So once you killed her, walk a bit away from her and wait a few seconds to see if there are some explosions. Those spikes will also hurt you a lot, so avoid them if possible. Rings/Amulets with more resistances. You may find some nice rares with bonus to 2 resistances. Also cube every amulet thas spawned with resistances with a oil of luck and hope to get a random +1 skills. Amulets also can spawn with a +1 skills from act 2 on on top of the lucky upgrade. Other than that try working on improving your gear with a focus on elemental resistances. Pro tip: Your act 1 merc has already served her purpose. Now in act 2 she's not as strong as before and your character has gained a significant amount of levels to unlock the last few abilities you needed. So when it comes to clearing mobs or damage you should be fine without her. So get an act 2 merc. The Shapeshifter merc is usually a really good option since he tanks a lot and is fast enough to easily get close to the enemies. The exemplar is better if you want some crowd control since retalite knocks back many enemies at once, making them unable to move and guaranteeing a safe gameplay. Or you can use the fighter mage, which is imho the strongest when it comes to damage. The new Bloodthorns skill really makes him a strong, viable option even without a weapon at all, whereas the other mercs should at least get a Pike from you, which you can buy from the smith in act 2 for a bit gold. Those spiders will spawn more enemies and also have an AoE poison attack. Don't stand close to them and focus your attacks on these enemies first! They also give lots of exp, so they are really nice for farming. They can spawn in the Sewers and in the Rocky Waste and Dry Hills. Although those critters are weak and can't do anything, they are annoying because as the name suggests, they spawn in ridiculous numbers. If you just keep attacking one of them you'll easily get swarmed and locked into hit recovery animation if your defense is too low. You should use a hit-and-run strategie or use an act 2 merc, since that one will easily block most of them for you. You can of course also use summons to avoid being pushed back. The pack spawns only in the Sewers in act 2. Radament has some nasty skills that allows him to nuke you easily if you have low resistances. Avoid walking through his lightning wall, since it'll greatly hurt you. Aside from that he can throw some thunderstones. So there are 2 strategies: Either don't stop moving and regularly hurt him from afar, or walk right into melee range to disable him casting his spells. His normal attacks don't hurt much, so melees have it rather easy. Again those walking gold chests. The strategy is the same as for the ones in act 1. It's jut a lot easier to kill them then in act 1 since you should have twice the level. Just make sure that if you want to farm them for gold, kill them in act 2 since they drop much more gold here. These guys are probably the strongest monsters in act 2. They drop relatively easy, but there is always a shaman ice clan, that stays behind. Once you kill the first few, the shaman ice clan lets the bodies of his fallen comrades explode. 2-3 casts and you can already die even with 40+ cold resistance. The strategie against them is: Ignore the Ice clans that walk towards you and run directly to the one in the back and kill him first. Watch out though. If there are multiple groups of Ice clans you might still become the target of their ice explosions. They spawn in the Claw viper temple and everywhere after the Arcane Sanctuary until Duriel's Chamber. Right in front of Duriel's chamber there are 2 Horadric Mages and Zolton Kulle. They fire very deadly lightning spells, which need lots of resistances in order to not die to them. Using an Act 2 merc or summons will help you block some damage, but if you don't have that luxury, you're better of keeping a tp open before you walk around the corner to Duriel's chamber. Use a Hit & Run strategy as melee if you need to. The 2nd act boss can give many characters troubles. He uses shower of rocks, which will hurt a lot in melee, and fortress against any ranged build. In addition to that he can buff himself with Idol of Scosglen, which gives him a huge AoE attack, too. You can use lots of defense against that. Luckily he doesn't have much HP. If possible, let an act 2 merc or some summons block him while you stay behind and attack from there. Only improved versions of your already existing items. Aim for a solid +50 to all resists. Those are enough to have an easy time until act 5. Pro tip: The act 3 merc is really strong without any gear investment. Thanks to Peace Warders your act 2 merc is very likely to get bugged and stuck somewhere. For ranged builds it's adviced to keep using the act 2 merc as a tank especially to make Mephisto stop casting his spells, for melee builds it's better to get an act 3 merc since it'll help you clear monsters with more ease. If you encounter this enemy, choose one: Run away or kill it as fast as you can! It spawns many copies of itself when it hits you. If you can't kill it and its copies fast enough you'll be completely surrounded and die an aweful death. They only spawn in the Great Marsh so you might be lucky if your map allows you to never step into that area. These enemies teleport you to a random location when they hit you. But watch out! They also cast a small trap that goes off 2 seconds after they teleported you away at the spot where they teleported you to. If they hit you, walk away and you should be safe since you don't get hit by all the projectiles. They also can easily knock out entire armies of summons so watch out. They can spawn in the Flayer jungle and onwards until Kurast bazaar. These guys have a strong poison attack, that hits the whole screen. Once you see them you want to take care of them quickly before the poison damage ramps up. They can spawn from the Spider forest onwards until the Swampy Pit. to cross the river and escape. While their damage is not strong and they aren't tanky either, their range and attack speed is absurd. You might see barrels coming your way while you're fighting. When that happens, you don't want them to get the better of you. The longer you stay immobile, the more damage you will take. So Instead of fighting the enemies in front of you, you want to search for them and kill them quickly. Weird name and an even weirder ability: on death they cast a short duration immortality on surrounding enemies. It's visible thanks to a white shield-like overlay. If you're mana dependant it's best to save your mana for 1-2 seconds after you killed them before you start attacking again. Note though that the modifier Life on attack still works, whereas Lifesteal doesn't work on immune enemies, so builds that depent on Life/Mana on attack can just keep attacking to stay safe. Frogs have an annoying charge attack. They can potentially stunlock you and nothing works against that. Neither defense, nor avoid, nor manually dodging. It's just an aweful enemy. Don't get swarmed, don't run into them head-on. Keep your distance if possible and attack from afar. Those are imho the strongest enemies in all of act 3. They can proc a very strong, screenwide frost attack. If you're with minions those frost attacks will proc a lot more often, easily taking down your life. They always spawn as a champion pack in the level where Lam Esen's tome spawns. I'd advice either ignoring them altogether or taking them on 1 by 1, neve as a full group. Those enemies only spawn in the temples on the Kurast Bazaar and Upper Kurast and in the Durance of Hate level 1. They use homing missiles that hit you often and hard, which makes them one of the stronger types of enemies. It's best to take them out before their damage can ramp up. Or, since you only encounter them in the Durance of Hate level 1 and since that level is rather small, you can just quickly run past them because they don't follow you. Those guys are invisible and always come in a pack together with Que-Hegans (no picture for them available). They give a huge chunk of Exp, so you actually want to encounter them. Watch out though, because the Que-Hegans can spawn more, weaker Peacer Warders, so it's best to kill the Que-Hegans before you kill the Peacer Warders. That might not be possible though due to how many enemies there are and that the both enemies are invisible. Peace Warders also have an attack that makes NPC's like your merc or summons flee. And usually it bugs them so much that they just disappear. In order to get your summons/merc work again you need to teleport back to town once. Peace Warders only spawn in the Durance of Hate. Though rare, they can spawn in Mephisto's level aside from their main spawn point: act 4, plains of despair. Heretics have a very strong piercing and auto-aim attack that also multihits. They are also fast and like chickens, always running. Unless you have lots of Defense you don't want to face them head-on. So melees builds are pretty safe against them. All ranged builds should definitely go back, luring them away. Because as long as they move, they don't attack. It's the same for summoners. Then take them out one by one. You want to have some decent cold resist against Mephisto. He casts the same thing that Shriekers casted already and it hurts a lot. It takes a bit time for that ability to activate, so it can very well activate after Mephisto's death so don't be too greedy after his death and rather walk around for 2-3 seconds before approaching the loot. The other harmful ability is important for ranged builds only because it's a lightning arena. It's a skill that can stun you and deals lots of lightning damage in succession. Once you're trapped, that's it. You'll most likely die if your lightning resist is bad. Even if it isn't, Mephisto's 3rd ability can reduce your resist. It's best to have something like a merc or summon approach him in melee range in order to stop him from casting many spells. Other than that: Try staying within half a screen away of him in order to avoid getting stuck in a sudden lightning arena. Mephisto is also a really good way to get Unique items and arcane crystals. Farm him to get some of your core items like a better body armor or a stronger weapon. in some random gloves. The runeword removes defense anyway, so don't bother about getting a good base. You might've already met them at Mephisto's place. Though rare, they can spawn in Mephisto's level aside from their main spawn point: act 4, plains of despair. Heretics have a very strong piercing and auto-aim attack that also multihits. They are also fast and like chickens, always running. Unless you have lots of Defense you don't want to face them head-om. So melees builds are pretty safe against them. All ranged builds should definitely go back, luring them back. Because as long as they move, they don't attack. It's the same for summoners. Then take them out one by one. These guys are invisible and can easily stunlock you to death, especially when there are multiple other enemies around despite the fact that only spawn in groups of 2-3. You want to kill them quickly. Ranged builds have the advantage of using an act 2 merc, who can block them for you, because most of the time you won't see them coming at you. The only way to beat them is to pray that your stunlock is paused for a moment where you can cast a strong spell to kill them. They only spawn in River of Flame and the Chaos Sanctuary. Another invisible mob that only exists in the River of Flame and the Chaos Sanctuary. They consume corpses of other enemies and throw deadly fiery boulders your way. You want to quickly walk away from those boulders because they hit really hard. Summons and mercenaries can detect them through their invisibility, so you might want to rely on your merc this time. Also, get lots of Fire resist. They are imho the strongest Elite monsters in act 4. Even though they are rather weak compared to other mobs like Firebloods, I want to add them here because they have a lightning ability that you can't dodge manually (don't mistake it with Avoid). If your lightning resist are below 30 they only need 3 of those attacks and you're done for. There's nothing you can do except stacking lightning resist even if you need to put 1-2 mystic orbs on a ring. However by the time you reach act 4 you should already have 50+ of all resist. It's just for those times where you are completely unlucky with drops and don't get lightning resist. Despite the fact that Diablo spawns with some other enemies around him, you will want to stay in the middle of the pentagram for 1 simple reason: As long as you're in melee range, he won't cast spells and will only hit you with basic attacks. If you walk away from him, he casts flamestrike, a fire attack that nukes a small area. He can also cast several stunwaves that have a range of multiple screens and he can summon more minions and Bloodstorms. The Bloodstorms are also really strong. As a melee build it's best to keep attacking him in melee range while swallowing potions. As a ranged it's good to stay near Diablo at first to kill the first few minions and let your act 2 merc run to Diablo afterwards. 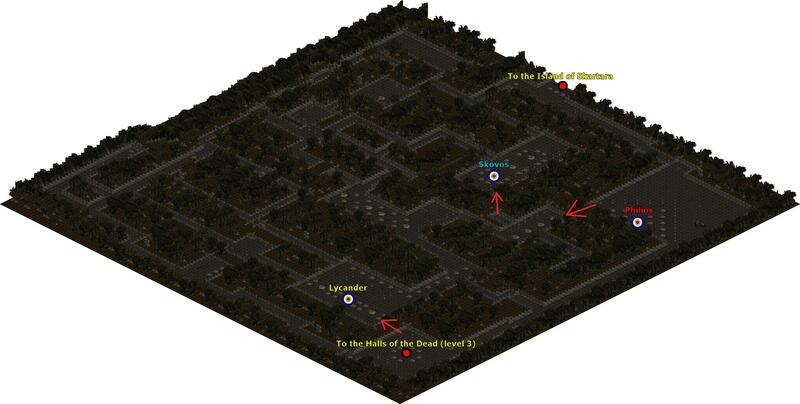 Once your merc is in melee range, go away from Diablo and attack from a safe distance. Also make sure to move often because of the many Bloodstorms Diablo calls forth. Reward: Ability to hire act 5 mercs, the strongest mercs in the game. See the previous section. It should be fine that way. This enemy spawns only in the Bloody Foothills and the Fridgid Highlands and sends out lightning strikes from very far away. The issue is that if your lightning resistance is low, those attacks will hurt a lot, while you face another problem: they fly away over terrain you can't pass if you get close and thus it's really hard to catch up to them. There are 2 ways to fight them: Get lots of lightning resist and run past them or get a skill that can stun or kill them from afar. Those little pests from the Fridgid Highlands cast a deadly fireball on death. Just make sure to kill them only when you have more than 50% HP. You can also run away in the opposite direction quickly after you kill them. That way you might be able to dodge those fireballs. This is another enemy that only spawns in the Fridgid Highlands. But this one is really annoying. Not only do they use the hit & run tactics, but they also slow your movement speed if you get hit by their projectiles, which also can hurt quite a lot if the damage stacks. Just make sure to get much cold resistance and some good movement speed bonus on your boots. You will encounter this type of enemy only at the end of the Fridgid Highlands and the Throne of Destruction. You can bait them easily, but when they attack, they spread deadly poison clouds. Just make sure to not stay in those clouds for too long since the damage quickly ramps up. If you're ranged that's even better! Just kill them from afar. While weak on their own, they cast Burning Veil, which buffs any enemy that passes through, greatly increasing the damage output. Just make sure that no enemy passes through the veil and you should be fine. Since they cast it directly on the player and the player walks towards them, it's very likely that nothing bad will happen. They spawn mainly in the Frozen Tundra and the Halls of Anguish and Pain. Spawning in the Halls of Anguish, Halls of Pain and the Ancient's Way, those enemies have an aura that throws back any melee damage to the player. You either need to end them quickly with conversion skills, or from afar. Life leech and life on attack helps melees a lot against these enemies. They look like the icy creatures from cLoD, but have a grey buff. The dangrous part is that they cast mindflay, which hurts a lot if you are hit in succession. The only way to resist them is to get lightning resist and to quickly take care of them while manually dodging the mindflay attacks. They spawn in the Ancients way only. .... or the death of every magician. But honestly, if you play a low defense build, those enemies will hurt. They also have the ability to lock you in hit recovery animation if you have low defense, so try to take out a few before they use their Storm Quills, then dodge, then attack again and repeat. Melee builds won't have any problems. Those enemies spawn in the Ancients Way and beyond. Spawning in the Worldstone Keep level 1 and all the Halls levels, this demon casts a Fairy ring from the corpses of its underlings. But don't be deceived by the name, because it's an ability that spawns many small totems that each throw projectiles at you. If you have low defense you may get locked in hit recovery animation. So you should defnintely prioritize killing these enemies. These enemies don't only teleport on you. They also debuff you so that enemies inside the arena ignore your defense. Its attack speed is also very high, which makes it possible for you to get locked in hit recovery animation. You can avoid that if you have a merc or a minion close to you, or if you quickly run away from the arena. They spawn in the Worldstone Keep level 1 and beyond, so take care. Similar to the Storm Shaman, these enemies that spawn in the Worldstone Keep 2 and beyond can lock you in hit recovery animation. The problem is just that they don't need a corpse. You don't want them to cast their fire cannonade, so quickly kill them while ignoring other enemies. Spawning in the Worldstone Keep 2 and beyond, those enemies can actually summon more enemies: Fire Beetles. Those beetles are weak on their own, but if many spawn you might have a problem. Aside from summoning enemies, the Masahattva also can cast a moving wall and stuns you over and over again, potentially stunlocking you. So if you want to approach this enemy, walk around that wall. They also cast a huge fire nova on death, so it's best to hide behind a wall if you can, or teleport just at the right moment over the fire nova so you don't get hit. Baal has many many ways to make you sad. He can burn your mana with a melee to low-ranged attack, teleports like crazy when he gets hit, casts a dark version of flame strike which you should definintely dodge under any circumstances, and he can push you back. On higher difficulties he can also summon more enemies to his aid, but since he's considered an uber boss in hell, I won't cover strategies against that as this walkthrough focuses solely on the progression through normal and nightmare. As for the annoying teleport from Baal: it's better to use strong single-hit abilities rather than multihit abilities because the latter will just make him teleport away faster, which makes it harder to get some damage in. The Dark version of Flame Strike is announced with a dark wave under your feet a few seconds before it hits, so keep track of that. And the mana burn ability can be dodged if you move in a circle around Baal or move away. Before you fight against Baal a Portal to another realm will open when you kill the infernal Contraption of the last wave of Baal's summoned minions. And yes, you should definintely go in there, because the charm you get helps you greatly. You should get 5000 armor before you go in there, or at least some summons or a merc that can tank for you, because most of the damage in there is physical.
. That can greatly reduce the time you need for this challenge. First create a TP at the entrance, then you teleport over the wall to lycander, kill that guy, teleport back, walk all the way up to Philios, kill that one, move to the top left corner of the room, teleport over, clear the enemies there, make a tp and the last teleport is a bit tricky. You need to move directly into the marked corner, move your mouse to the top right corner of the screen and then press teleport. If you just teleport straight to the top, it won't work. The priestresses themselves are rather weak though. Lycander leaves a magnetic field, which punishes builds with low defense. So don't walk in if you see some lightning bolts on the ground. Skovos however can cast a Blizzard, that hurts a lot if your cold resists are low. As for Philios: I never had any problems with her, so I personally think she's the easiest. The lava pit she casts has a rather small AoE, so you can easily just walk out of it. There are a few ways to farm even early on. Especially when it comes to farming Uniques and Gold. Gold can be farmed in act 2, the Rocky Waste and the Dry Hills. There you just need to kill Grubbers to get a decent amount of gold. Of course if you have access to nightmare, it's better to farm there, but if you at some point end up with not enough gold to revive your merc for example, you can also farm them in normal. As for Uniques: There are 2 places that are commonly used to farm arcane shards and arcane crystals. The first one is Mephisto in hatred. You get a set amount of uniques and if your waypoint is very close to Mephisto's area, this is the best farming spot for arcane shards in the game. And the good thing is: Every character can farm him easily early on. The other possibility is farming Nilathak for 3 uniques per run. There are some downsides when you farm him. For example you need more cold and lightning resistance, and not every character can easily clear it at the same level/speed. However there are only 3 layouts of the halls, so it's relatively easy to remember those few layouts and farm Nilathak consistently. There actually is a whole guide just for farming Uniques early on. It explains in detail both ways and gives some additional tips & tricks. So if you want some more knowledge, go ahead and read it. Even if you just read the mephisto part, it should still help you out. Edited by HechtHeftig 4 days. Nightmare is not much different than normal, except that the mobs are harder and that there are 2 new challenges: The Veteran Token challenge and the Ennead challenge. Close to the end of each act you can find special monsters that drop their Veteran Token. Collect 1 Token from each act and cube them with your class charm (see Ennead Challenge) in order to receive +1 to your class skills and +20% more exp gain. Note though that those enemies can also spawn in hell, where they are significantly easier to deal with, given the general power boost of the player thanks to better gear and lots of more levels. The Clawnstorm terror is the one that has the highest chance of encounter simply because it can spawn in so many different areas that you absolutely have to pass through. Luckily in the Jail levels they may or may not spawn behind bars, which makes it easy to kill them from afar. If they get close to you, they'll cast a Lorenado attack, which makes you suffer poison damage. Since they use such an attack and you just came from normal, they may seem a bit hard due to your low poison resist. I'd say they are the 2nd strongest of all Veteran monsters just because you could have low resists. So either bait them as melee or kill them from a decent range, that way you'll survive an encounter with ease. Those ones are the easiest to kill, but hardest to find veteran monsters beacuse they only spawn in 1 area. But if you encounter them, you'll notice from miles away because they cast a rain of fire while they are still out of your sight. It's easy to dodge since it takes about a second to half a second until the rain of fire actually hits the ground, so the tactic is: Keep moving around them and occasionally attack. Their attack hurts a lot, but since it's easy to dodge, I don't think of them as a great threat. The Glowing Blobs will pounce on you, hitting you before you'll notice. However they drop really quickly and don't do much damage. So just like the Fairy witch, they are rather easy to kill. Honestly, you don't want to encounter them in nightmare. Because the landmass are the strongest of all the Veteran monsters. They hurt you a lot, they have lots of HP. The only thing they are bad at is chasing after the player. Either use a hit & run tactic or wait until hell, where they are significantly easier to kill imho. Builds with lots of Defense should also watch out for the Shower of Rocks they cast on attack. Another easy Veteran monster. You can easily bait them and their main attack, Bladestorm isn't very strong either. They also drop very quickly, so there isn't much of a strategy needed. At the point when you encounter them you should have already decent gear may that's why they feel rather weak compared to the other veterans. When you kill Mephisto in Nightmare difficulty, a portal will open up. Step through it after you reach level 80 to access Kurast 3000 BA. You have to go all the way to the top right, where you can find one of 3 Necromancers. Finish them off and you'll get a Heroic Torch. Cube that Torch to receive your Class charm. That's it. The skeletons in K3K are not particular hard to kill or deadly. But they get buffed and turn purple thanks to the totems that are placed all over the map. Kill the totems in order to weaken the Skeletons. Watch out though. The totems throw circulating hammers around them. If you don't have much defense you're better off staying away from the totems and attack them from afar. The necromancers themselves are nothing to be afraid of. Just like the totems they have the ability to summon more skeletons, but nothing else. Just kill them and you're good to go. This is by far the strongest enemy in all of the nightmare difficuly. The strategy from normal doesn't change. However some builds may not be able to deal with him easily and struggle a lot instead. In that case there's only 1 advice I can give you: Keep a townportal open. You have 30 minutes to kill him, after that the level gets locked, which means you can exit, but not enter the level again. Even with weak weapons you should be able to finish him off in that time. I know it may be frustrating, but once you kill him you gain access to the endgame content, so it's really worth it. This guide won't cover the ubers themselves, but instead how to prepare your gear for them. While you may or may not have already used crafting methods in order to get a full set of T4 Uniques and runewords, there's still a bit I'd like to tell you about the advanced stats on items. Stats that are easy to obtain, and give you a considerable advantage. There are many types of speeds. Attack speed, cast speed, hit recovery speed, Block speed and faster Run/walk. And with this I want you to understand what speeds are and how they affect your gameplay. And yes, reaching certain breakpoints is always a simple way to get better, because of how easy it is to achieve it. Diablo is a game that has 25 frames per second. And using this as the foundation for speed, there is only one way those speeds can affect you: It's a jump from 1 frame to another. That means that for example a 100% increase in attack speed doesn't actually double the amount of weapon swings per second. But instead, it's limited to frames and their breakpoints and depends on where those breakpoints are. For all the breakpoints there is the Speed calculator at the bottom of this page which allows you to see what weapon on which character would have what breakpoints. - Attack speed and cast speed also depend on which weapon you use. For example the cast speed on staves is usually a lot higher than on Hammers. - Morphs also don't utilize Block speed, because they don't have a block animation. In order to increase the Block speed in that case, you need faster hit Recovery, which basically grants you twice the profit. - Walk/Run speed is the only exception and doesn't use any breakpoints at all. Crushing Blow is a really interesting mechanic, that was nerfed with the last patch, making many bosses immune to that stat, but I think I should still explain what exactly it does, since it can potentially increase your kill speed if your damage is low and you hit the enemy many many times with weaker attacks. In essence a Crushing Blow (in short CB) takes 1/4th of life of an enemy if you hit an enemy with a weapon-based attack. The effect is halved for ranged attacks, and halved another time against bosses, if not completely removed. That means if you have 10% Cb, you have a 10% chance on a successful hit to take a quarter of your enemie's life away. Depending on your weapon damage this can increase your killspeed significantly or it can turn out to be insignificant. If your damage is already high, you should not strive to get more CB, but instead go for Deadly Strike. I would not advice getting as much CB as possible. But if you have it on an item, that's fine. This mechanic works exactly like a critical hit. It's exactly the same, except that it's called Deadly strike if you get it from an item, and Critical hit if you get it from an ability. That means your attack does twice the damage. And yes, this again only affects your weapon-based attacks. A mere 10% Deadly strike can thus already increase your total damage output by 10%, that's why it's a really popular and useful stat. You already know the percentual counterpart: Physical resist. But this stat actually reduces the damage as a flat value, before the physical resist is taken into account. Example 1: An enemy attacks for 1000 damage. You have 50% physical resist and 200 flat damage reduction. Example 2: An enemy attacks twice for 500 damage each, totalling in 1000 damage. You have 50% physical resist and 200 flat damage reduction. So flat damage reduction is always useful when there are enemies that hit you very often with weaker attacks, whereas physical resist is useful at any given time. A bit flat damage reduction can never hurt. You can get 30 physical damage reduction on each ring and your amulet thanks to mystic orbs. - It's affected by every weapon damage attack, both melee and ranged. - It only heals you according to how much physical damage you dish out. If your skill convertes 100% of the damage into magic for example, you won't get any life back. - It's effectiveness on higher difficulties is greatly reduced. - It only heals you when you swing your weapon right at the enemy in front of you and you actually hit the enemy that way. - It's best utilized with a high attack speed and lots of attack rating. - Heals you every time you, and only you kill an enemy. It doesn't heal you when your summon or merc or friendly player kill the enemy. - You can get it from Mystic orbs and by socketing perfect rubies your weapon. So in order to survive everywhere you will need a healthy mix of these 3 stats depending on your build. Of course, casters don't need life on attack. While this is merely a stat that negates a durability loss on your items, it's incredibly important in order to utilize Ethereal items. Other than that you don't really need it. Also, it can only spawn on Jewels, so make sure to get one if you plan on using an eth item. Edited by HechtHeftig 2 days. Maybe add in a bit about setting up gear in between normal and nightmare. Like run nithalak + mephisto for ACs to make your own TUs and uptier them according your stats/level. That should give people the ability to finish NM and start Hell. Assa - can open any chest without keys. Pls add +hp/mana per lvl by class. A1 - Andi cast Meteor only in front(it is more profitable to run towards the meteor shower than along the longitudinal), if you have some minions andi is easy to kill in the distance (just non stop spam around andi, that good advice for amazon with elems). I think a good way to raise power early on for everyone is Niklathak run, and it worths mentioning. After rescueing Anya, go and open Hall of Pain wp. Then max lightning and cold resist (a lot of monsters in there use these elements)and farm Niklathak for just 30 mins. He drop 3 tier 2 unique, a high level rune, and the monster around him drops a lot of perfect gems. Get a full Tier 2 equipments (tier 3 or 4 for weapons), fill sockets with what you need, and you are more than ready to do Lvl challenge and Baal fight. These are some nice suggestions. I‘ll add them ASAP. Sadly my internet provider decided to have troubles today, so I‘m only on my phone. But I‘ll adjust the guide and continue working on it when everything is up again. HechtHeftig, I love you man. Thanks!